There have been on going complaints about the RSS feed Google News generates at Google News Help forums. The complaint is that Google is trimming the title portion of the article in the RSS feed. Let me show you an example. Why the change? 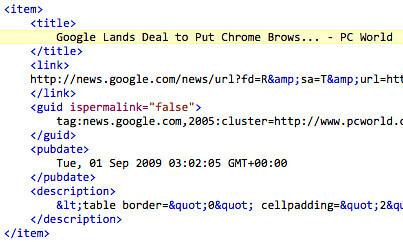 I think it might have been around the same time Google News began altering their News RSS feeds at the end of July of this year. Inbal from the Google News team said, "we apologize for any inconvenience; the fix should be released within the next days." Inbal added, "please note, though, that in the example below the title is still displayed without truncation with the article itself (it's repeated right below the truncated one." True, true true.